Blue Water Rafting has been offering a variety of high adventure snorkeling and sightseeing tours on Maui since 1985. Our tours are an awesome small group adventure! Climb aboard our fast moving high-tech Blue Water Raft and let the adventure begin! You will be snorkeling in the bay where dolphins spend a lot of their time, so there’s a good chance that you will be seeing pods of the spinner or bottle nose dolphins. Very cool! South Maui is where the last volcanic eruption flowed, occurring a little over 220 years ago. It is a rugged area full of lava tubes, lava arches and sea caves. The Kanaio coastline is not accessible by car and only a few can hike the lava rocks surrounding this Coastline. As you travel around this southernmost tip of Maui , the ocean water seems more pristine, clear and beautiful blue-green! You will truly be amazed by the color of the water. Our Blue Water Rafting adventure is snorkeling without the Molokini crowds. 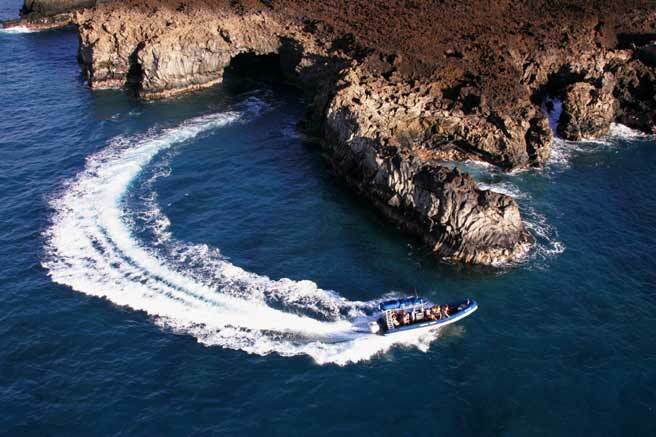 Guests can see dolphins and turtles in their natural habitats, volcanic lava in all it’s forms and enjoy a scrumptious lunch on board! Our friendly crew keep the party going! Snorkel gear, beverages and lunch are all included!